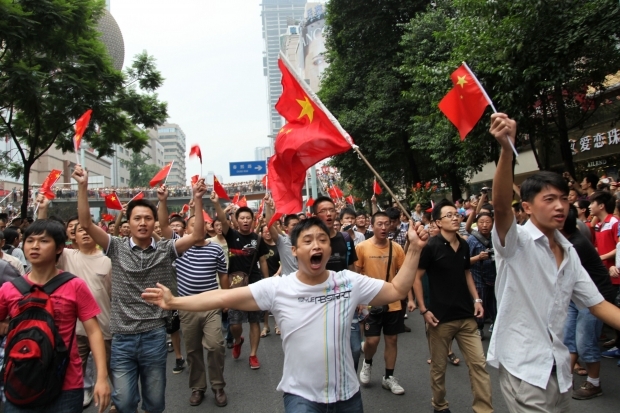 Chinese protesters wave the country's flag as they take part in a demonstration in Chengdu, Sichuan province against Japan’s claim of the Diaoyu Islands, as they are known in Chinese, or Senkaku Islands in Japanese, August 19, 2012. “You are nothing without your motherland.” It’s a trite phrase, one that seems unlikely to stir the blood of even the most dyed-in-the-wool nationalist—but it has found recent currency in China. An essay with that title has been making the rounds on the Chinese Internet since mid-November; it then went viral in early December, with state media giving the rant widespread play. The spike in attention occurred just before a visit from U.S. Vice President Joe Biden at a moment of rising tensions between China and the United States; and the timing may not be an accident. The 2,100-character, eighteen-paragraph screed stirs up patriotic Chinese sentiment using a combination of fear mongering and selective history that nationalists anywhere would likely recognize. To wit, it cites the falls of the USSR, Saddam Hussein, Muammar al-Qaddafi, and Hosni Mubarak as examples of Western powers subverting uncooperative regimes and leaving their countries in shambles. And it warns that Chinese people should be on guard against the United States and other Western powers, because they are trying to bring down the Communist Party and plunge the country into chaos. “The Americans took down the USSR and eliminated its largest rival,” the essay warns. “Now China has become the country that poses the biggest threat.” The American response, according to the essay, has been to “cook up the Diaoyu Islands controversy,” a high-stakes tiff between China and Japan over the ownership of a few small islands in the East China Sea. The essay insists it is a “well-known fact” that the United States’ goal has been to foster “domestic trouble inside China in order to subvert the leadership of the Chinese Communist Party,” or C.C.P. If the U.S. plot were to succeed, “total chaos” would result. The high level of state media support strongly suggests that the Chinese government approved the surge in attention, according to Jessica Chen Weiss, an Assistant Professor of Political Science at Yale who studies nationalist protest in China. She notes that the post’s language is “squarely directed at the West,” as opposed to Japan, the usual target of Chinese nationalist ire. On November 23, China declared an “air defense identification zone” in the East China Sea that included territory disputed with Japan; the United States responded on November 27 by flying unarmed B-52 bombers through the space without informing Chinese authorities. Such a tense climate, Weiss notes, might provide “an opportune time to showcase” the post. None of this means the essay’s popularity was purely engineered—the crude logic it employs has a receptive audience in China even without peddling from state-owned media. While China has surpassed Japan as the world’s second-largest economy and is now poised to take its place as a world power, many Chinese still cannot shake a deep-seated, almost primal fear that their country will again be reduced to a state of utter weakness and dispiriting humiliation at the hands of Western powers and Japan. The anxiety is rooted in China’s historical subjugation by foreign powers in the nineteenth and twentieth centuries, in particular what Chinese call the “century of humiliation.” That period saw invasions by British and Japanese forces and a resulting series of unequal treaties that ceded valuable swaths of Chinese territory to foreign control.